The UK's biggest folk band, The Conservatoire Folk Ensemble, mark their 20th anniversary year with a new album, ‘Painted’, and a series of special appearances. 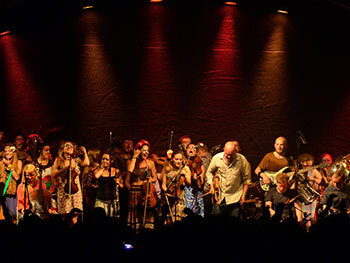 Formed at Birmingham Conservatoire, part of Birmingham City University, by fiddle player and arranger Joe Broughton in 1997, the band's touring line-up features a stage-challenging 50 members. Among them are 15 horns, four cellos, five percussionists, five electric guitarists, plus fiddles, flutes, clarinets, double-bass, electric bass, euphonium, acoustic guitar, octave mandola, and a harp – with many also being vocalists. Run on an elective basis, The Conservatoire Folk Ensemble has become an enviable addition to the institution’s range of performing ensembles. Officially kicking off the anniversary is a hometown appearance at Birmingham's Town Hall Friday 12 May. Performing on the opening night of the Imagined Isle festival, the show will see the current line-up joined by as many former members as possible. This could see around 100 musicians take to the stage for a never-to-be-repeated spectacular. The show will be followed by a series of headline dates, including the ensemble’s own Power Folk 4 festival (Sunday 11 June, Birmingham), and a trip to Shrewsbury, where they’ll be opening the folk festival (Friday 25 August). 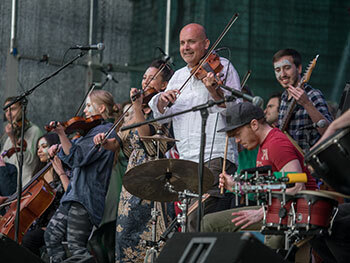 Still based at Birmingham City University’s Birmingham Conservatoire, the ensemble have established a reputation for creating energetic and powerful shows. Welcoming students and staff from the prestigious conservatoire ensures that the standard of musicianship remains exemplary. The personal influences of each member shapes the set-list, as traditional English and Celtic reels slide into full-on rock grooves, funk, jazz, hip-hop, ska and reggae. Eastern European and Asian flourishes can also be heard, reflecting the rich cultural heritage of the group. ‘Painted’ is the ensemble's first full studio album, and follows two live collections (2009's ‘Sardines’ and 2014's ‘The Official Bootleg’) and a live DVD (2007). With a cover image by fiddle player Ning-ning Li, which echoes the distinctive make-up sported by several band members at shows, its 10 tracks aim to document the breadth of the ensemble experience. Combining new arrangements of traditional tunes with several original compositions, highlights include Joe's deliciously raucous take on the classic ‘Fairy Dance’, and ‘William Taylor’, which features a commanding vocal by vocalist and cellist Julie Claire. Later, Rosie Tunley and Rosemary Wilkes take on vocal duties for ‘Rain And Snow’, where harp lines and strings are soon joined by percussion, bass and electric guitar, making one of the album’s most intricate cuts. Classic Irish tune ‘The Butterfly’ gets the full-on Folk Ensemble treatment before seguing into guitarist Josh Wunderlich's frenetic arrangement of Japanese duo The Yoshida Brothers’ ‘Kodo’. With a nod to their 20 year history, they even revisit a pair of Bulgarian tunes (‘Ruchenitsas’) first played by the band back in 1997, when the ensemble numbered a mere 14 members. Elsewhere, the percussion section morph from African drumming to Samba, to out-and-out rock, always pinning the band down, while bringing an excitement and studied richness to the material. “The challenge for us has been really capturing the power and intensity of the ensemble without it impacting on the delicacy or fragility of the quieter, more subtle moments. There’s such energy, when the entire ensemble perform together, but these are world-class musicians, and the tracks on ‘Painted’ really demonstrate how skilful their individual playing is. The Conservatoire Folk Ensemble’s ‘Painted’ (SAE Records) is released on Sunday 11 June and has been made possible thanks to support from the Faculty of Arts, Design and Media at Birmingham City University.